Extensions are X and Pro specific plugins available for download for all customers with a validated purchase of X or Pro. You can easily download and manage all of your Extensions directly from the WordPress admin area under X > Validation or Pro > Validation. This article covers documentation for the Content Dock Extension and goes into detail on certain features where needed. After installing and activate Content Dock, you'll find it's settings under the X menu item if X is installed and activated, or the Pro menu item if Pro is installed and activated. Content dock allows you to show a widget on a scroll or after a set period of time. You can see some examples of Content Dock in action over on our demo site for the plugin. As Content Dock is a widget it means you can use any widget from any WordPress plugin or theme! And of course, the default WordPress widgets giving you limitless possibilities. Position - Left or Right. This simply allows you to select whether you want Content Dock to display on the left-hand side or right-hand side of your website. Width - Pixels. This allows you to set how many pixels the Content Dock should take up. The default value is 350 pixels wide. Display - Percentage. This option allows you to set when the Content Dock should display. The default value is 50, if you keep the default value, the Content Dock will display after the user has scrolled down 50% of your page. Auto Trigger Timeout - Percentage. This allows you to automatically set the Content Dock to display after a period of time (seconds) if a user hasn't already reached the display percentage set in the previous option. Setting 0 for this option disables it completely. Do Not Show Again - Cookie timeout percentage. This option allows you to disable the output of the Content Dock if someone has already seen it by setting a cookie. Do note though if the user has cleared their cookies the Content Dock will once again show. The next settings all pertain to where Content Dock will show. Active for all pages - checking this will make Content Dock display on all your pages on your website. Keep this un-checked if you only wish to display Content Dock on specific pages. 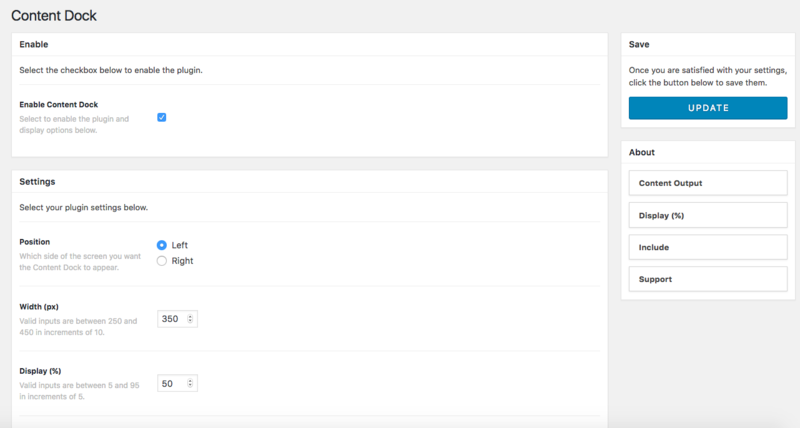 Include Pages - This option lists all the pages on your website for you to select which ones you want Content Dock to display on. Active for all posts - checking this will make Content Dock display on all your posts on your website. Keep this un-checked if you only wish to display Content Dock on specific posts. Include Posts - This option lists all the posts on your website for you to select which ones you want Content Dock to display on. The image will override what is set to show in the Content Dock. Only set this if you just want an image that links out to a different page/website. Otherwise, leave this unset. 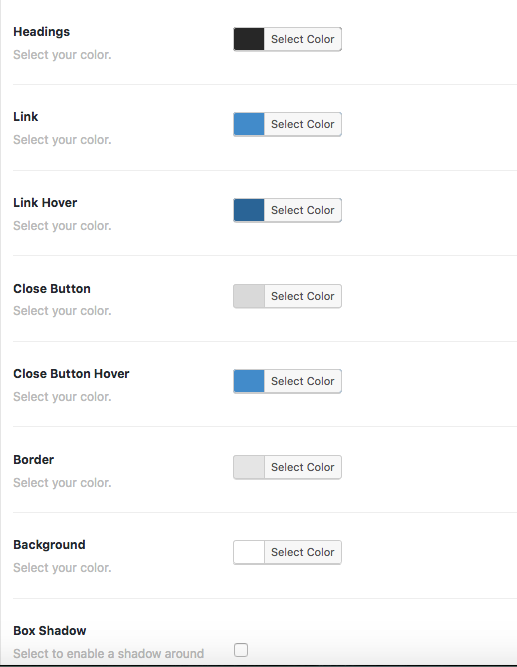 The remaining options all pertain to colors, including the button and headings color and all are color selectors. Once you're happy with everything, scroll back to the top of the page and click on Update to save your Content Dock Settings. On the left-hand side you have all available Widgets and on the right-hand side all available Widget areas including Content Dock. Drag any widget you'd like to the Content Dock widget area on the right-hand side. Once you've done the above, you have successfully configured Content Dock, congrats! The Content Dock is visible on displays larger than 767px and will be hidden on any displays smaller than this. This is for numerous usability reasons, which mostly have to do with ensuring that your site’s primary content is always accessible and not completely hidden by the Extension and that the close button is not inaccessible. Can I add a bow/window/background specifically to the header & content of my Archive pages? Is there a good video beginners guide for Pro?